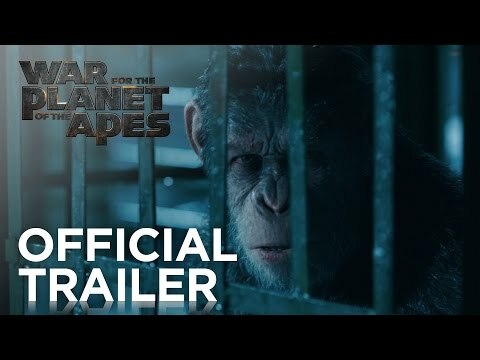 What’s the story: When a nocturnal raid on the apes’ forest village leaves leader Caesar (Serkis) grieving and consumed with rage, the intelligent monkey seeks revenge on the man responsible, the warmongering Colonel (Harrelson). What’s the verdict: When Fox announced their Planet of the Apes reboot way back in 2010, reaction was indifferent to openly hostile. Hadn’t Tim Burton’s 2001 banana slip remake put paid to the franchise? So, there was cause for jubilation when Rupert Wyatt’s 2011 Rise of the Planet of the Apes quietly became one of that year’s best movies. 2014’s Dawn of the Planet of the Apes (we know, Rise, Dawn, confusing), in the hands of new director Matt Reeves, also modestly emerged as one of that year’s finest films. 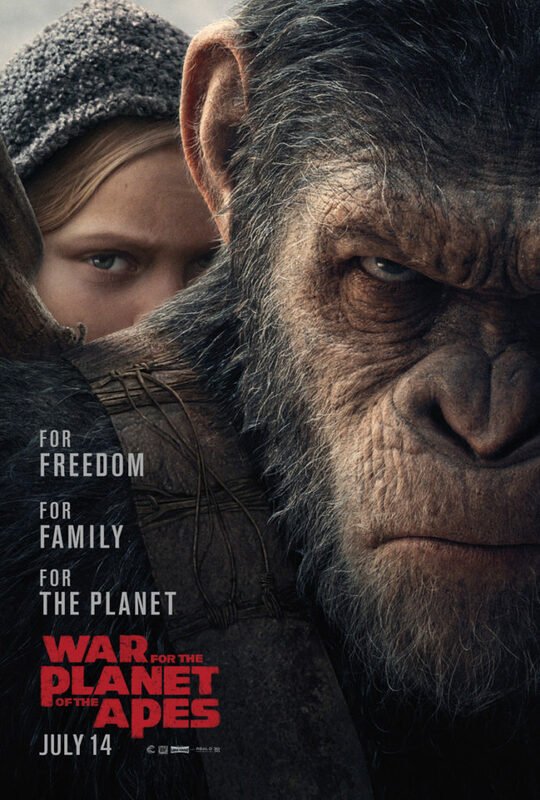 Little surprise then that War for the Planet of the Apes (again helmed by Reeves) is another triumph, making this Apes reboot one of the decade’s strongest movie trilogies. The filmmakers still cannot get the titling quite right. Despite the name, those expecting Saving Primate Ryan will be disappointed. There is explosive action here, but Reeves and his Dawn co-writer Mark Bomback are more interested in Caesar’s struggle to remain civilised in the face of man’s inhumanity than simians vs. sapiens battle scenes. Ape-pocalypse Now then, as cheeky in-movie grafitti would have it. This means War is a far more unusual (and rewarding) adventure story, about one ape’s road to enlightenment. Deliciously, there is a strong sense of biblical epic that sits surprisingly well alongside the evolutionary subplot. And although this isn’t a war movie, there are POW movie traces when Caesar and his trusted lieutenants attempt to free monkeys imprisoned in the Colonel’s compound. The Western is another genre from which inspiration is drawn. The Canadian Rockies, the four horse-riding primates and a young, mute girl they discover (played by expressive-eyed Miller) recall Robert Altman’s McCabe and Mrs Miller and John Ford’s The Searchers amongst others. What makes War so thrilling are the FX miracles hard-earned by those folks at Weta. This Apes trilogy has been a consistent technical marvel, but the work here is its finest hour. The snow-soaked fur, the subtle facial expressions, everything combines to sell you on a world where apes speak (even if most still sign). Will this be the film to win the reboot series its long-deserved Best Visual Effects Oscar? It should also bag Andy Serkis a Best Actor Oscar, or a nom at least. Acting behind photorealistic simian features, his Caesar traverses a range of emotions and hardships on his quest to protect his tribe. Harrelson, part Apocalypse Now’s Colonel Kurtz, part crazed cult leader, is an enjoyably hammy foil. Konoval, behind lots of mo-cap as orangutan Maurice, and Steve Zahn as erratic chimp comic relief Bad Ape (ironically named) also take home key performance plaudits. Action spectacle is present and correct, but there is joy in just looking around the world the filmmakers have created. Small touches such as “Bedtime for Bonzo” scrawled on a soldier’s helmet or gorillas siding with humans nicknamed “donkeys” (part packhorse, part Donkey Kong) all breathe further life into the series’ universe. Elsewhere, subplots and character names further suggest how future events will bring about the original Planet of the Apes (a reboot of which is almost guaranteed). And Reeves cannot resist a political swipe, with the monstrous Colonel forcing simian slave labour to construct a giant wall to repel undesirables. Kong: Skull Island was throwaway monkey business. This should be the movie for which you truly go ape. Like this review? Try out The Electric Shadows Podcast available now for subscription on iTunes or here.